(October 2017) When job searching, be sure to look for more in a company than just the paycheck. What are the benefits? Do the employees seem happy? Are there opportunities for career advancement? These are all important factors when considering an employer. Here are three steps from Monster.com to make sure a company is the right fit for you and your career. We talked about asking meaningful questions in September’s blog. You can scroll down or click here to read over those. The important thing to remember in an interview is that you're interviewing the company just as much as it's interviewing you. They are trying to read you, and you should be trying to read them. Ask open-ended questions to make the interviewer think about the answer. “Why do you like working here?” “What makes people want to stay here?” “What opportunities for advancement exist in your company?” Have some questions planned before the interview so you’re not caught off guard. Many times, companies will take you on a tour of the facility during an interview. Take advantage of this access to make some mental notes. Do the people seem happy? Are they friendly? 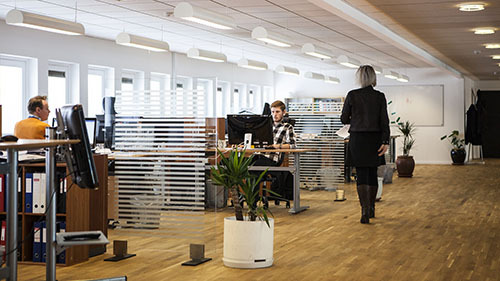 Is the work environment clean and well-lit? A few simple observations can help determine a healthy workplace. Monster.com says to arrive a few minutes early and talk to a receptionist, if you can. They have great insight into the company and can be a great source of information. Before accepting a job offer or even applying, be sure to research the company. Find out its history and its vision. Where are the leaders steering the ship? Is that somewhere you want to go? Maybe you know of someone who works at the company or has in the past. Find out what they think and if they think you’d be a good fit for the culture. Taking the time to complete these simple steps can prevent you from jumping into a job you’ll dread going to every day. Look before you leap. You’ll be glad you did. More from the HEBSBA blog.